I am back from 2 incredible weeks in the United States with Tom and his sister. As you know, we visited San Francisco for a few days and then took a bus to Reno where we picked up a van to drive into the remote Black Rock Desert! Our goal there was to join 80.000 people in a 10 day temporary art and music metropolis called Black Rock City. 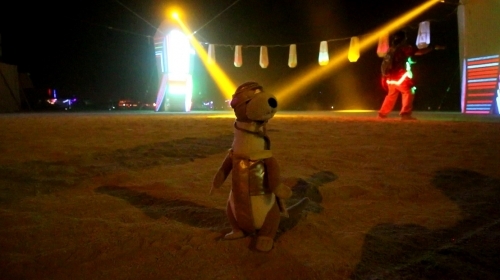 This event is mainly known as Burning Man Festival and it is the biggest one of its kind in the world! One of the goals of this event is to leave absolutely no trace, so everything that is brought into the desert is also taken back out! That means everyone has to bring their own food, water, accomodation and survival gear and we had to do 2 days of preparring and shopping before going. We camped close to the center of the temporay city and visited all the sights by bike, which is the main means of transportation. There are many photogenic art installations and buildings to visit and music scenes are around every corner. 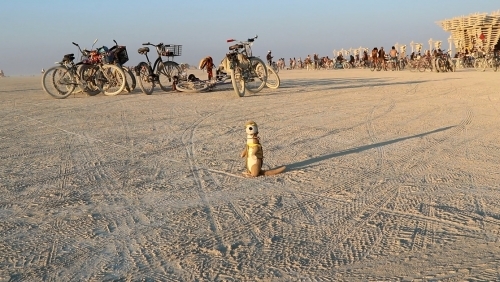 Most of the people that go to Burning Man make beautiful costumes and decorate their bikes. I was not allowed inside without a make-over, as you can tell from the pictures. My orange life vest would have been too warm anyway since daily temperatures often exceeded 40*C (100*F) and I really liked the outfit that Tom and Rose put together for me. Mainy of the party people complimented me for it! Talking about partying, I have been going crazy at some of the DJ sets there! The music, lights and atmosphere were really good and we danced for hours! Since 80.000 people live in this place, it is very easy to get lost and this almost happened to me several times, espacially because for me the World looks even bigger! Luckily I always wore my name tag, even with my new clothes, so I would always have been able to find my way back to Tom and Rose if needed. I am now on the way to Norway with Tom to join the ship Fram again, that will take us to Morroco and the Amazon in Brazil! I will of course make a report so you can follow my Adventures so please stay tuned!